We’d spent the day packing boxes, cleaning and packing a moving truck and at the end of it all we were emotionally and physically exhausted. Some dear friends had invited us for dinner that night, knowing that we would otherwise be having takeaway. 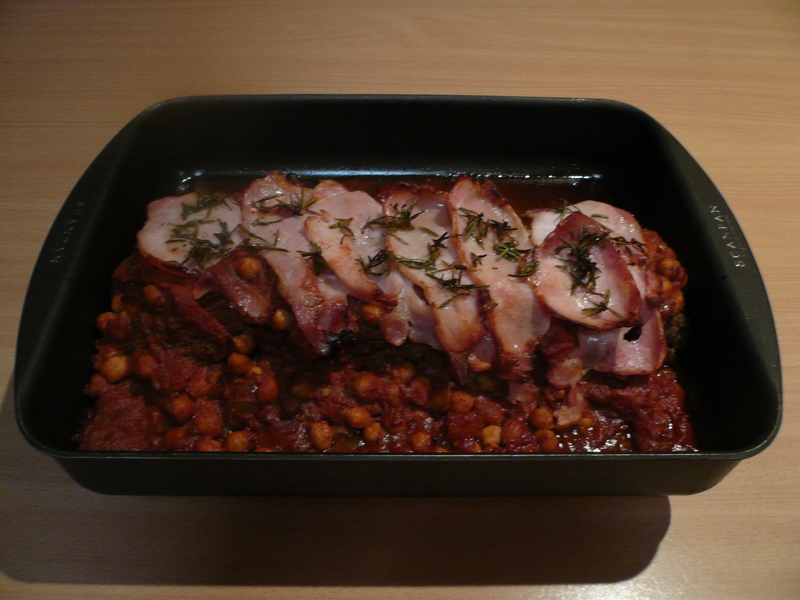 As we wearily sat up at the table, this yummy meatloaf by Jamie Oliver is what they served up. Man, did it hit the spot! The filling meatiness energized us again and the warm, content feeling it gave was so very comforting. Over dinner, these friends allowed us to just be ourselves and didn’t expect anything of us after such a full-on day. We reminisced, and laughed together despite the tiredness and sadness we were feeling. It was one of those special times of togetherness expressed by these friends in humble generosity and it’s a memory that I treasure dearly. The meatloaf itself was the best I’d ever had and now whenever I make this dish, I think of that evening of genuine hospitality. Everything in this meal can be made ahead of time, so it’s perfect for having people over. The recipe that follows is mostly the original, though I’ve fiddled a little with the quantities to maximise size and affordability. Total cost, $10 and it serves 6. Preheat the oven to full whack. Peel and finely chop one of the onions—don’t worry about technique, just chop away until fine. Place in a large frying pan on a medium high heat with 2 lugs of olive oil and a pinch of salt and pepper. Add the ground cumin and coriander. Fry and stir ever 30 seconds for around 7 minutes or until softened and lightly golden, then put into a large bowl to cool. Wrap the crackers in a kitchen towel and smash until fine, breaking up any big bits with your hands. Add to the other bowl of cooled onions with oregano, mustard and ground beef. Crack in the egg, and add another good pinch of salt and pepper. With clean hands, scrunch and mix up well. Move the meat mixture to a board, then pat and mold into a large football shape. Rub it with a little oil. You can either cook it straight away or put it on a plate, cover and place in the refrigerator until needed. Place the meatloaf in a Dutch oven-type pan or baking dish, put into the preheated oven, and turn down the temperature immediately to 200 degrees celsius. Bake for a half an hour. Peel the other onion and chop into 1/4-inch pieces. Peel and slice the garlic. Finely slice the red chile. Place the onion, garlic and chile in a large pan on a medium high heat with 2 lugs of olive oil, the paprika, and a pinch of the salt and pepper. Cook for around 7 minutes, stirring every 30 seconds until softened and lightly golden. Add the Worcestershire sauce, chick peas, tomatoes and balsamic vinegar. Bring to a boil then turn the heat down and let it slowly simmer for 10 minutes. Taste the sauce and season with salt and pepper if needed. Pick the rosemary leaves off the woody stalks and put them into a little bowl. Remove the meatloaf from the oven and pour all the fat from the pan over the rosemary leaves and mix up well. Spoon your sauce around the meatloaf. Lay the slices of bacon over the top of the meatloaf and sauce. Scatter over the rosemary leaves. Put the pan back in the oven for 10 to 15 minutes, until the bacon turns golden and the sauce is bubbling and delicious. Serve with a mashed potato and steamed veg and some wedges of lemon for squeezing over—this will add a nice sharp twang.